Easter is a time when the whole family gets together. A time when family and friends gather for breakfast, brunch or an outdoor or indoor lunch or evening meal. Children celebrate with the madness of an Easter egg hunt, special treats or just enjoying the fun of school holidays. 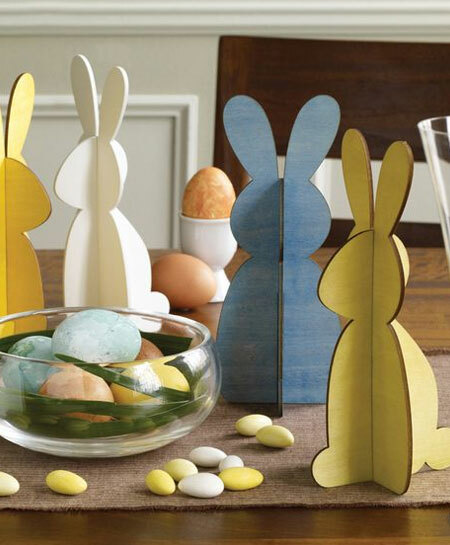 We have put together a selection of some great craft ideas that you and your family can make together to add Easter decor to your home or table. 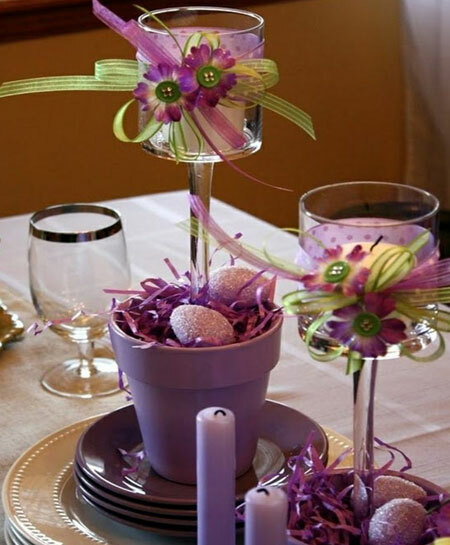 Set the table for Easter with homemade decor that is easy to make and looks absolutely stunning when you have family and friends around over the Easter weekend. Whether you have basic DIY skills, love crafting, or neither - there are some pretty easy craft ideas here for everyone, including the kids. 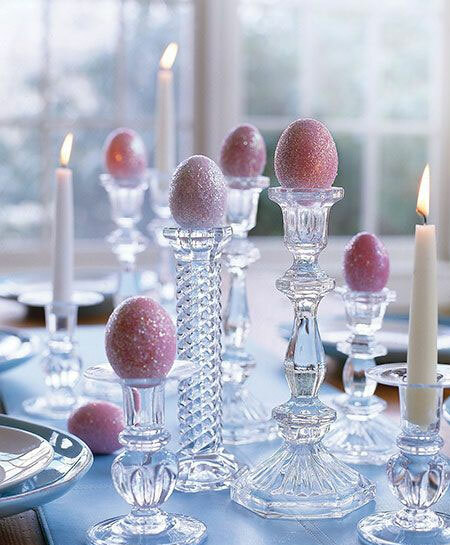 Glittered Easter eggs look so wonderful on an Easter table, especially in the evenings when you light up the candles. 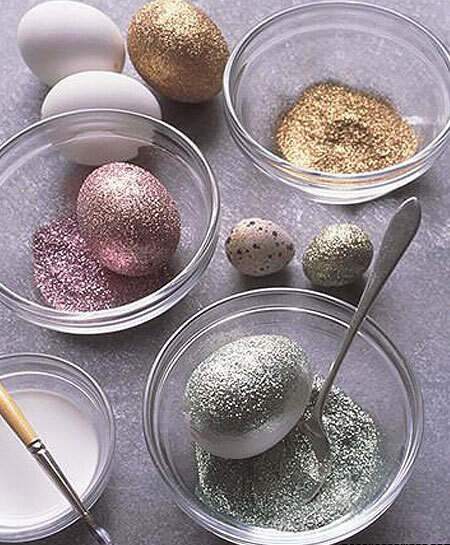 And making your own glittery Easter eggs is a project the entire family can do. You can blow-out your eggs or you can hard boil them, whichever is the easiest option for you and then simply coat them with craft glue and glitter. Invite guests into your home over the Easter weekend with a handcrafted Easter wreath. All you need is a circular foam wreath (or use a pool noodle to make your own wreath) and some accessories. 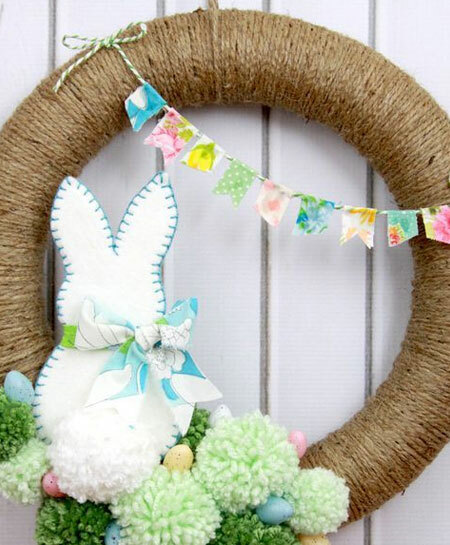 Love this Easter bunny wreath and you don't need a sewing machine for this project - just do a basic blanket stitch around the edge. 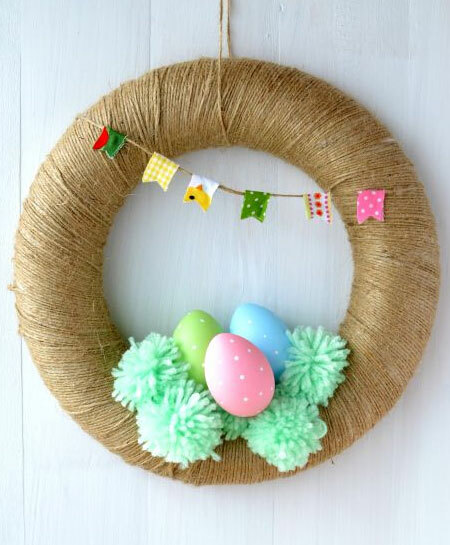 An even easier Easter wreath to make has eggs painted in Easter colours combined with colourful pom poms. Use a hot glue gun to attach these onto your foam wreath wrapped with twine or string. 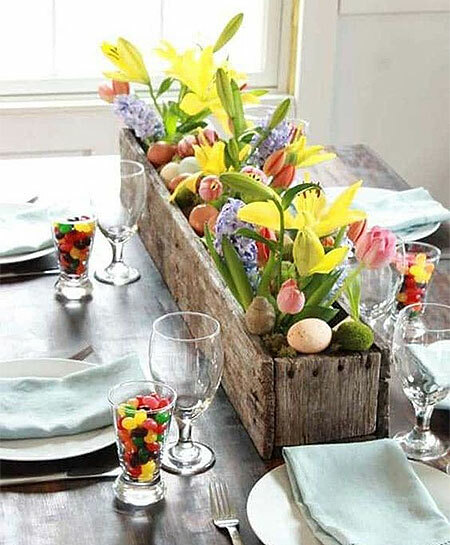 How adorable are these little Easter trees as a centrepiece for a dining table? 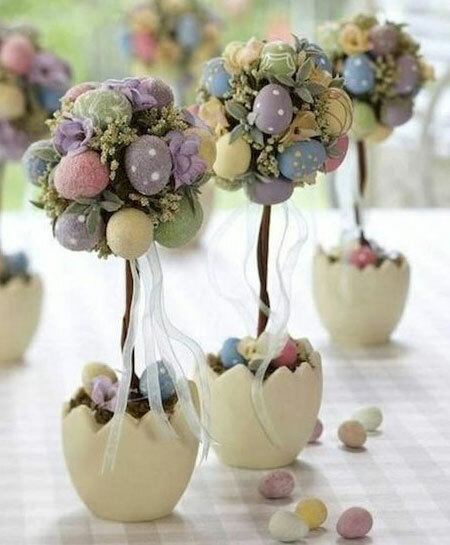 You can use air-dry clay to make the egg-shaped bases and then use small branches and dried foliage for the tree tops. Adorn with small, colourful eggs painted in pastel colours. 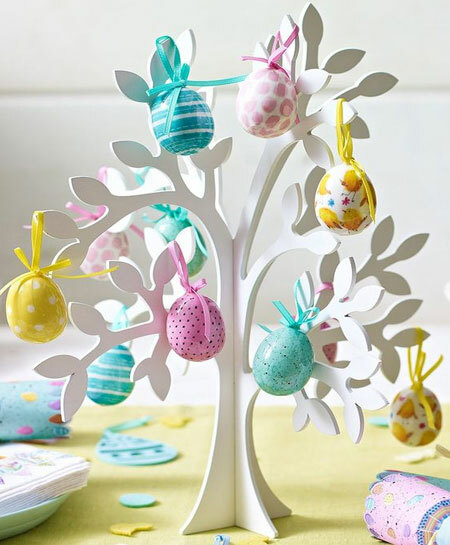 The kids will love this Easter tree that can be placed on the kiddies table or on a display shelf. All you need to do to make this Easter tree is cut out two tree shapes so that they can be slotted together. Paint in your choice of colour and then add some painted eggs and colourful ribbons. 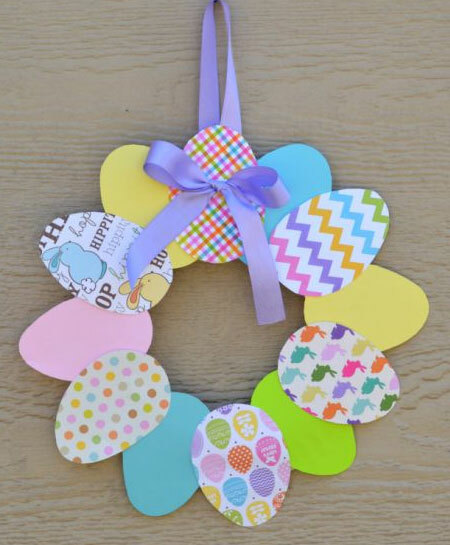 Wreaths are always a popular choice for Easter and this wooden Easter wreath is easy to cut out of a piece of Masonite with a jigsaw. Once you have cut out the shape, cut out colourful patterned paper to stick on, and embellish with ribbons. 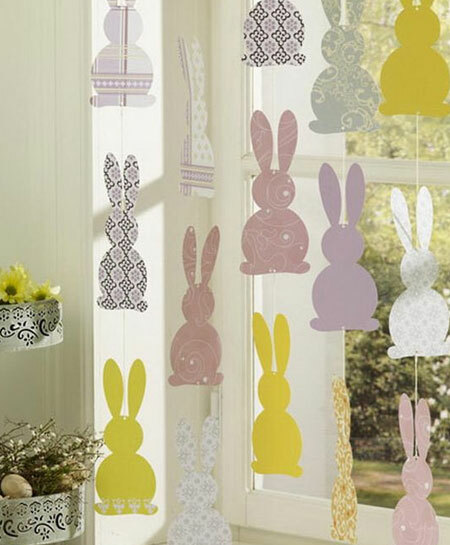 For those more of a crafty nature, this Easter bunny display gives an Easter touch to any home and can be hung in front of a window or over an outdoor dining table on the patio, Cut bunny shapes out of card and then cover these with leftover wrapping paper or patterned fabric and glue in place. Here's another easy project for those with basic DIY skills. Use a jigsaw to cut out the shapes in a piece of Masonite or hardboard and paint on a bunny design. Glue these onto a solid block and place at your entrance or in a hallway where guests will be able to enjoy them. 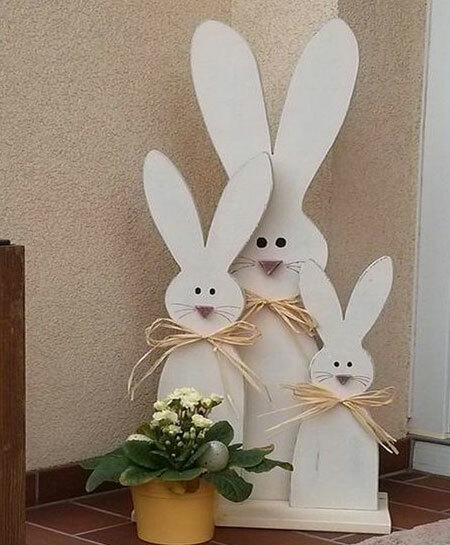 If you like to do recycling projects whenever possible, these cardboard bunnies are quick and easy and a great way to re-purpose any cardboard boxes you have. Cut out the shapes so that they can be slotted together and painted in Easter colours. 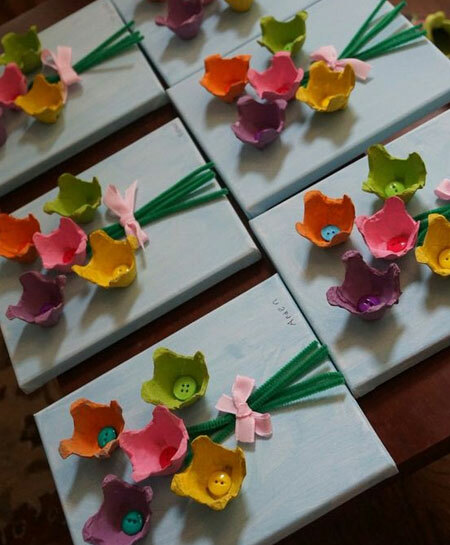 It can be difficult to keep the kids busy during school holidays, so we have also included some projects where the kids can keep boredom at bay and add to the Easter celebration. 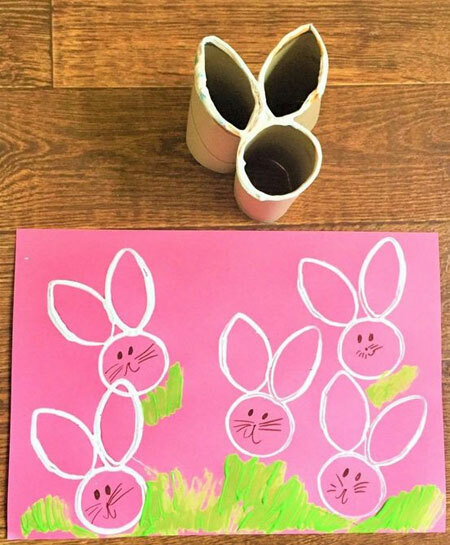 Both of these kiddies Easter projects are a great way to incorporate recycling and let the kids have some fun at the same time.